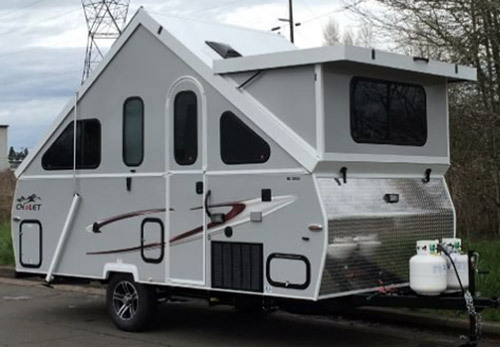 Chalet XL-1935 is company’s largest A-frame travel trailer; attractive layout and features, hard-side front dormer and power roof lift system makes it ideal for getaways for two…. 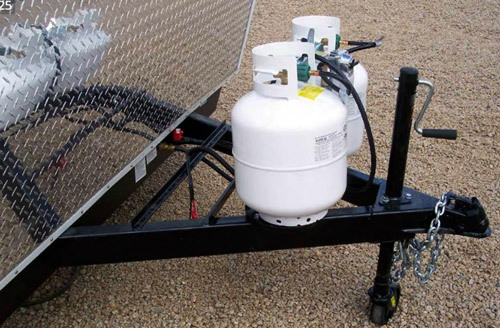 Chalet Inc. operated in RV business for more than 3 decades offering some of the largest (and well-appreciated) A-frame travel trailers as well as truck campers. Unexpectedly, in 2014 the company closed the doors. Two years later thanks to RV-enthusiasts Mr. M.Saeed and M. Almayah the business (and the name “Chalet”) was brought back to life. Today the “new-old” company focuses only on the design and production of A-frame travel trailers. Thanks to close collaboration with Chalet’s former owner and re-employment of former production staff the transition was swift promising successful business future. 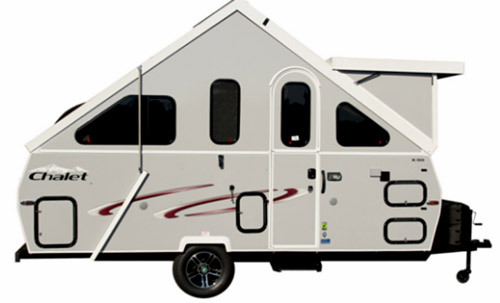 Currently the company offers the following A-frame travel trailers: lightweight model (LTW, just 12’9” long), Classic (Alpine and Arrowhead, both 16’6” long) and XL series (models 1920, 1930 and 1935 – all 18’7” long). 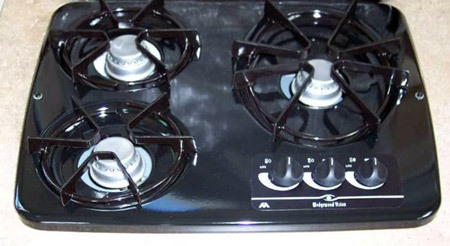 The main difference between the models of XL-series is the floor-plan. For the 2017 presentation we selected the model Chalet XL-1935 as it offers the best combination of standard features and living space. While the model XL-1920 is designed to sleep 4 (presumably 2+2 kids), model XL-1930 for 3 (2+ 1 kid), the model XL-1935 is planned for family of 2. 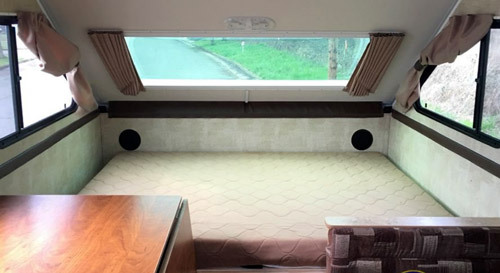 Well, while the XL-1935’s side dinette can be easily converted into an extra sleeping place for child, the whole beauty of this model is its more spacious and better furnished interior – a clear advantage worth to keep “intact”. 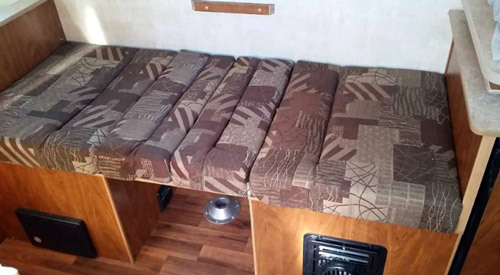 The interior furnishing is quite impressive as for this class of folding campers. 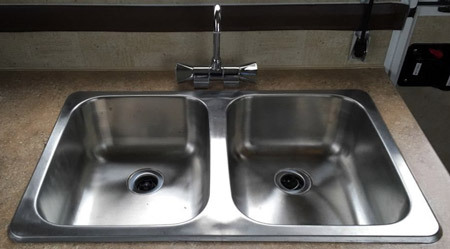 The galley located at the front of the camper is equipped with 3-burner stove, 3 cubic feet refrigerator and double-bowl stainless-steel sink with faucet. 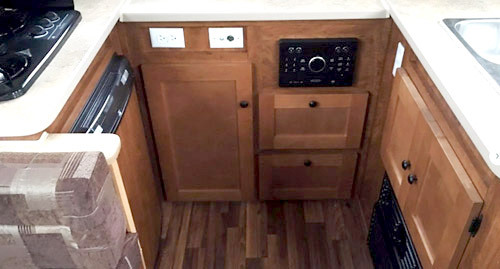 The cabinetry offers plenty of storage and countertop space. And thanks to the front-dormer (standard in XL-1935), the whole kitchen area has genuine 80 inches headroom. 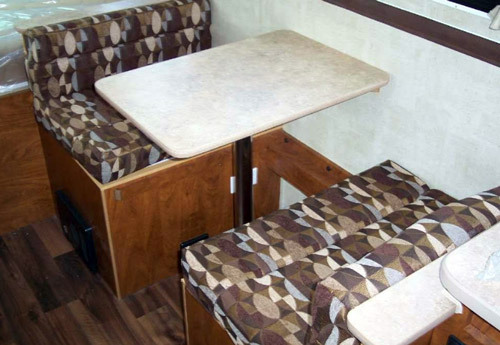 The dinette (table with soft benches) on the side of the camper provides tight but secure place for two persons. If needed, it can be converted into sleeping place but frankly, just for young child. 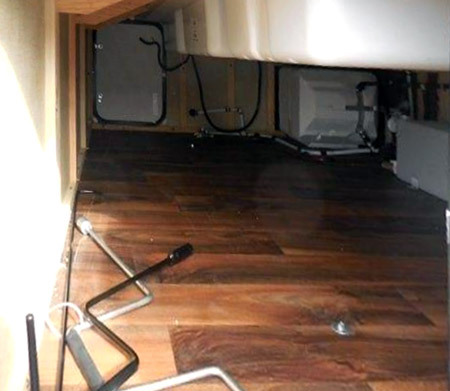 The queen-size bed located at rear-end of the camper offers sleeping comfort. What may not be very comfortable is the access to the bed – enough to get in/out but not friendly when it comes to make the bed, change linen etc. Bed’s right side is blocked by the dinette and the left one by the drawer cabinet. 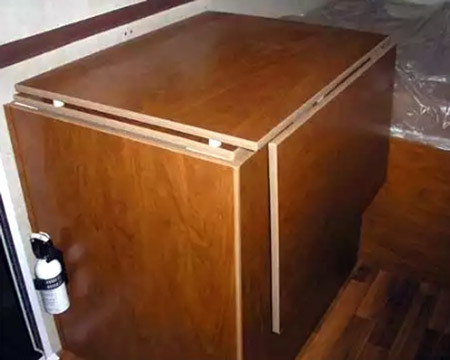 The bed can be lifted-up to give access to three under-bed storage containers. 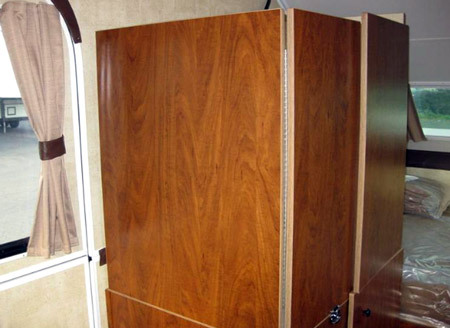 BTW - when it comes to storage space, all XL-models have exterior pass-through storage at the rear side of the camper. 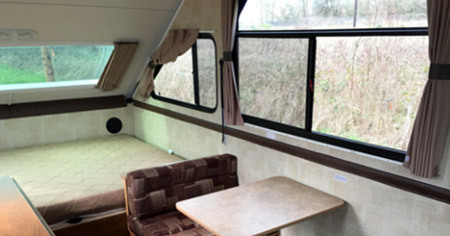 It is quite spacious, ideal for all kind of camping gear. 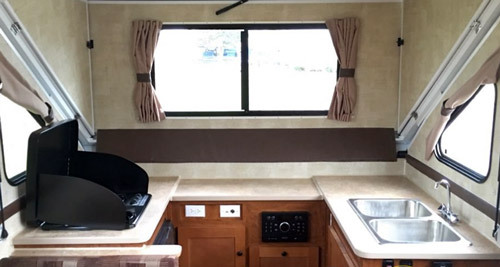 Several windows on both sides of the camper as well as large rear skylight and panoramic front window (dormer) make the interior bright. They also create the feeling of an open space and closer contact with the surrounding nature. 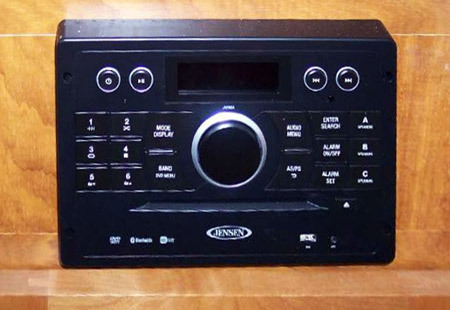 The entertainment center includes Jensen’s Audio/Stereo (CD/DVD/AM/FM with speakers including two exterior ones). 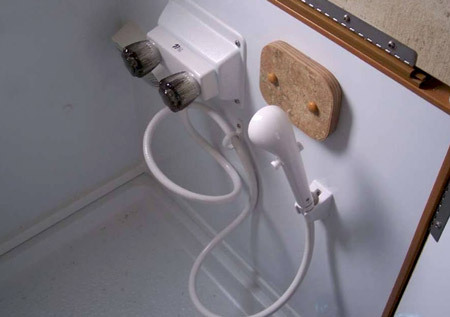 You will also find that the camper is cable pre-wired (standard feature) so if there is nothing else to do you can hook-up your TV to the campground’s grid. All XL-models are equipped with standard power Roof Lift System. It makes the roof set-up /take down process easy, effortless and fast – just at the touch of the button. Practically, your manual involvement consists in moving up/down both triangular side walls and opening/closing the front dormer. The bottom line is - the whole process can be finished within 1 minute (greatly appreciated especially in rainy weather conditions). But nothing comes free, the price to pay for this “luxury” is an extra weight (compared to manual lifting system). It’s not very big incremental change, but as we know very well - pounds are adding-up quickly. To put it in the right perspective - with the dry weight in the range of 2,200 pounds (depending on options) the XL-1935 can be still easily towed by many crossovers, SUVs and minivans. 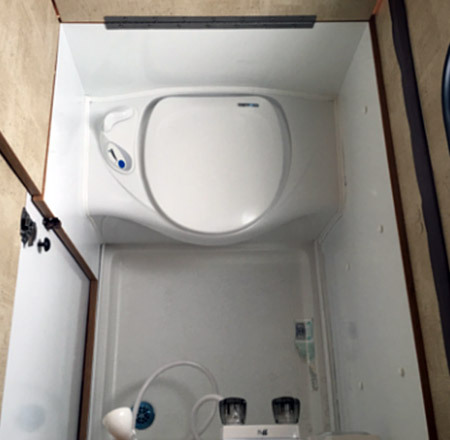 The door-side drawer cabinet can be replaced by optional cassette-toilet or hard-sides wet-bath. The latter comes as the package including combo shower/cassette toilet, grey water tank, water heater and outside shower. Definitely the package may be very helpful, but at the same place it makes the interior space more crowded (especially when privacy walls are raised up). The Cool-Cat system (A/C and Heat Pump) will not only provide more comfortable summer vacations, but at the same time will extend camping season. The unit is built into the kitchen cabinet so what you see are only interior and exterior vents (there is no box sticking-out of the wall). It should be noted that the body of XL-1935 (similarly as all other Chalet models) has basic thermal insulation (walls, floor and roof). 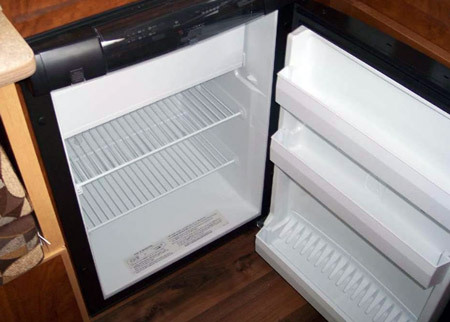 As the result with the help of A/C-Heat Pump you can efficiently maintain a comfortable interior temperature (unlike in canvas pop-up campers). The rear receiver allows you to attach bike rack. This option seems to be more “compatible” with the nature than TV (but hey, it’s your choice). The Solar Package (80W panel, 10 A controller and wiring) may be a good choice if you consider “off-grid” camping. While the XL-1935 is originally pre-wired for two auxiliary batteries (tongue-mounted tray), the solar power will help to keep them charged and ready to use.